Have you ever wished for an EASY kindergarten play with a part for every child (24!) in your class? Then our HeidiSongs version of the Gingerbread Man is just what you are looking for! It is absolutely ADORABLE, and parents and students alike just LOVE IT! Want to hear more? Read on! There is no doubt that putting on a play can be extra work and extra stress, but when I see the children having such a wonderful time, it makes it all worthwhile. Want to see it the play? How long does it take to teach? How long does it take to teach the kids the Gingerbread Man primary play? You can teach this play in just a few weeks, but you'll have to focus on it every day if you want to get it done quickly. In other words, you won't get a lot of other teaching done, but the children WILL learn the play! As far as sets are concerned, we used a painted cardboard box the first year for an oven. It fell apart before the show ever went on and I had to make another. The next year, a parent made me one out of wood. If you have a playhouse oven that is big enough for a child to fit in, then that will work, but you will have to deal with the probability that the kids in your class will spend the rest of the year climbing in and out of that oven during playtime! I always use a table or teacher’s desk for the Gingerbread Man to climb up on as he sings his “Run, run” song. I cover it up with a bridge that has been made out of an unfolded and flattened cardboard box. I think that you can see what it looks like if you look at the video clip from the show. A parent painted the box to look like a brick bridge going over a stream. So, the Gingerbread Man runs around and around the bridge/table, chased by whomever, and then finally climbs up on the bridge to be sort of “out of reach” of the chasing characters. The bridge can be folded up flat and stored in a closet. I also poked some holes into it and ran a piece of yarn through the holes to tie it onto the legs of the table. Otherwise, it falls down. The flaps of the box lay flat on the ground and look like water. Another thing I added as time went by is a backdrop of a Gingerbread Man house that was painted by another artistic mom. She actually painted it for me on a real painter’s canvas so that it would last a good long time. But again, this is not required. We also hang up some giant silvery snowflakes that hang from fishing wire above the stage. They sparkle and glitter a lot, and that makes the whole thing pretty. But again, it’s nothing that you can’t do without. We got them from Target after their Christmas season ended. They were just hanging up, and we asked if we could have them when they were done. They said that it would be no problem, and called us when they were finished with them. I’ve used them ever since. I have seen teachers do this play with paper hats only! (We do not sell patterns for these hats, sorry!) The costumes I made are mostly just sweatpants dyed to whatever color you need, if necessary. You can see my costumes below. We add a sock tail and a hat of some type, usually made out of felt. This little Gingerbread Man book is a WONDERFUL way to introduce the play to the children, because this version is about a class full of children acting out the story of the Gingerbread Man! This is a read along, sing along book that goes right along with our play and works GREAT in a listening center! The whole play takes about 12 minutes to listen to from start to finish. One thing that I absolutely LOVE about putting on class plays is making them so that everyone gets a part! When I wrote this, I never imagined that I could expand it to include a part for every one of my children!! And indeed, at the time, I had more than thirty children, so I might not have been able to pull it off. But now with twenty-four children, I can indeed do it, and last year when I had 28, I did it as well! Originally when I wrote the play, it had an old man, an old woman, a little boy, a little girl, 3 farmers, 3 bears, a fox, and the Gingerbread Man. In the play, first the family chases the cookie, then the farmers chase him, then the bears chase him, and last of all, the fox chases him. To give everyone a part, I simply added an extra farmer, an extra bear, and then I added a group of four bunnies to chase the Gingerbread Man and simply played the “Lookie, Lookie, Here’s a Cookie” song and “The Gingerbread Man’s Refrain” an extra time so that they could chase him. Then I added a “Santa group” and did the same thing with them so that they could have a chance to sing that song and chase the Gingerbread Man as well. The Santa group included Santa, Mrs. Claus, two reindeer, and two elves. I added these characters to the cast to make sure I had a part for every single child. We had Santa, Mrs. Santa, two elves, and two reindeer. They all chased the Gingerbread Man as he ran by, just like the bears, the farmers, and the fox. The very short elf was a three year old sibling of the Gingerbread Man who was something of our “class mascot,” so we put her in the play! LOL! 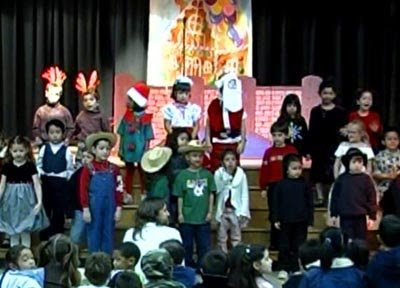 Her big brother was the Gingerbread Man, and you can see her standing right next to him in the first class photo above. She didn’t want to leave him. It was so cute! I always have a parent helper put each child into his or her costume and take a picture of each one of them. Getting photos of them is sooo much fun! 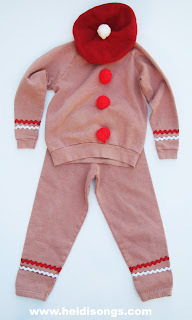 The Gingerbread Man’s outfit is a white sweat suit died a cinnamon color, with red pom poms pinned on the front. A Santa cap makes it cute. We had some red rick rack that we had glued onto the suit at the wrists and ankles, but it fell off, so a mom sewed it back on. 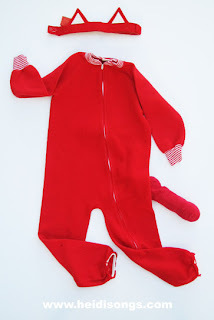 The fox’s outfit is just a red blanket sleeper, a simple felt headband (with some fabric stiffener ironed to the back of the band) and some triangle ears sewn on. It attaches with velcro in the back by folding over itself. We have a red sock tail with a white tip painted on it, and it pins to the back. The little fox always steals the show! 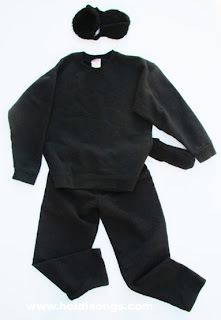 The bear's costume is simply a black sweatsuit with a black sock for the tail and earmuffs for the hat! 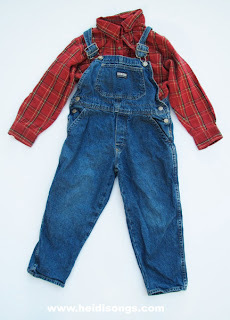 The last costume is the farmer's costume, which is just a child's overalls and a red shirt. I had the overalls from when my daughters were little, and then found a flannel shirt on sale. Note: The following costumes are unnecessary unless you want to give extra kids parts that include a "Santa Group." An alternative to this is to use other animal costumes that have nothing to do with Christmas, such as the bunny costume at the end of this post. 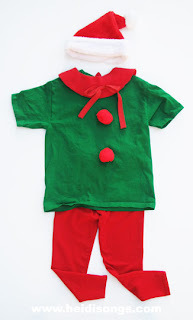 The elf’s costume is just red leggings, a green t-shirt, and a round felt collar! No sewing needed! I pinned on the ribbon bow and I bought the smallest Santa cap I could find when they went on sale for half price. Santa’s beard was made by a different team mate. 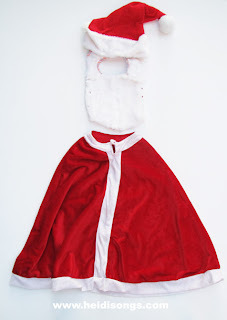 She purchased a child’s costume that was a Santa cape, and then made a beard out of a white bib and some cotton balls! 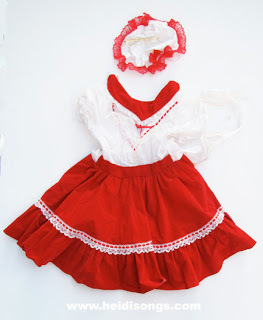 Mrs. Claus’ costume was simply a holiday dress that was a little girl had one year when we wanted to cast her as Mrs. Claus. Her mother said that she thought it would work. Then we added the cap to the costume; I think perhaps her mother made it for us. The reindeer’s costume is just a brown sweatsuit with a sock tail pinned on, and some headband reindeer ears that I purchased one year AFTER Christmas when they went on sale. The bunny costume is an old pink blanket sleeper that my own children used to wear when they were little! Then I pinned on some cotton balls that were glued together for a tail, and gave her a headband with bunny ears that I once again got on sale AFTER Easter last spring! I hope you have found this information helpful! Please tag me or send me some photos of your littles if you decide to put this on!!! I love seeing the pictures and videos!